SAHABAT SMI Consulting Sdn Bhd (SAHABAT SMI®) a “Bumiputra Status” business entity was incorporated and commenced on 10th August 2004. 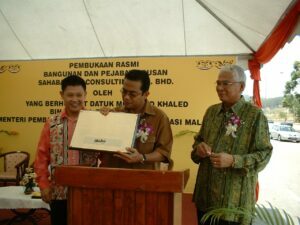 SAHABAT SMI® was officiated by Minister of Entrepreneur and Cooperative Development (current Chief Minister of Johor), YAB Dato’ Sri Mohamed Khaled Bin Nordin and graced by chairman, Y.B. Dato’ Rahim Bin Ramli, The President, Council of Johor Royal Court. To be the leading organization providing comprehensive financial and business solutions for business entrepreneurs. To deliver the most practical solutions in all related expertise for business entrepreneurs. The Mark of Business Solutions. For discerning entrepreneurs who concern about growth, SAHABAT SMI® brand of business consulting services are not only reassuring but also forward-thinking.